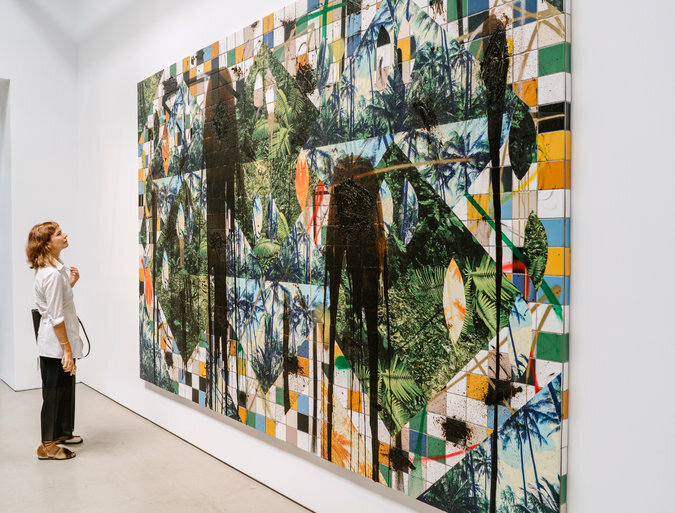 Rashid Johnson’s impressive exhibition “Fly Away,” at Hauser & Wirth’s Chelsea gallery, unfolds over four spaces, each containing very different works in painting, sculpture or installation. They form a quasi narrative, loosely linked by recurring, often Afro-centric, materials and motifs, in which race is the central concern, expanded by references to history, décor, personal identity and art. While many artists opt for overblown when given free rein in this nearly 10,000-square-foot showroom, Mr. Johnson approached the challenge judiciously. He has spread out his abundant talents, giving different works their own gallery — and for the most part he keeps the scale intimate. His work is in many ways Conceptual, but conveyed by a strong material intelligence in any medium. The first gallery is the only one that verges on overblown, but it puts visitors, especially white visitors, on alert, and the more time you give it the more you’ll get from it. This gallery holds six large paintings, each with up to 36 black, expressionistic faces in a big grid. Rather than painted on canvas, the faces are rendered as if with a big, soft black crayon on white ceramic tile redolent of Western kitchens and especially bathrooms. The point is unmistakable — filth versus purity — but it is contradicted once you notice that the crayon is really a mixture of wax and black soap. (A little Googling reveals that it is often called African black soap, known for its healing properties, and first made in Ghana.) So there’s no binary, just two forms of cleanliness. Look extra closely and you’ll see that the faces are also slashed with repeating lines that form loose, often diagonal grids, as if the artist himself found them unbearable. This is another point about Mr. Johnson’s art: He sometimes walks a fine, angry line between art-making and something like vandalism, creating and destroying. The next, much smaller gallery contains three complex, improvisational paintings, each titled “Untitled Escape Collage,” that create an Edenic mood. Sort of. Mr. Johnson has collaged large, diamond-shaped photographs of palm trees or lush tropical plants onto now colorful expanses of ceramic tile. Sometimes big ellipses are cut from them, creating a subliminal suggestion both of masks and Ku Klux Klan hoods. In the best painting the ellipses rain down like spearheads. The works are completed (or elegantly defaced) with spray paint, scratchy daubs of black soap and big, velvety pours of the melted soap mixture. In their colorfulness and use of photography these pieces represent a new course for Mr. Johnson, and combine aspects of the work of Richard Prince and Julian Schnabel with his own sense of urgency. They seem a bit muddled so far, but that may be part of the point. Ambiguity is a frequent tactic: Escape could refer to a getaway to a vacation paradise, or to evading slave-traders who tore Africans from the paradise they already inhabited. If you choose to leave the large arena of face paintings through a second door, you’ll find yourself in another small gallery, and a kind of banquet hall. Three handsome paintings (or reliefs) adorn the walls, contrasting mirrored tile with either white tile or burnt red oak, similarly completed with the black soap and spray paint. Their Deco vibe may momentarily distract you from the large inverted stick figures formed by the mirrored tiles that dominate each piece, all titled “Falling Man.” He’s a rudimentary, early Pac-Man-like creature, a free-falling loser in a video game or real life. 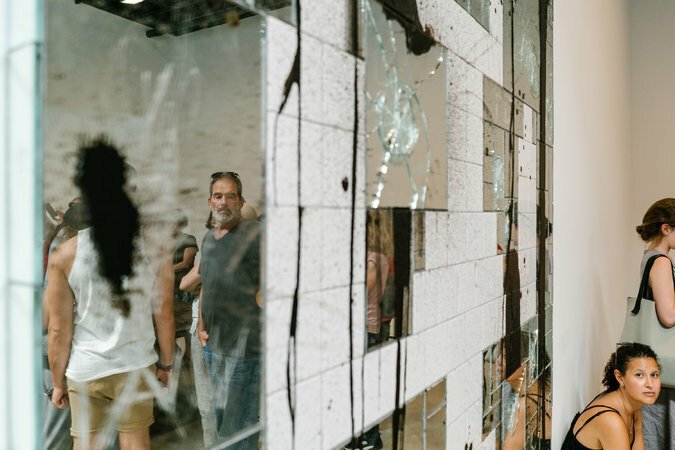 Once you see this mirror man who only reflects, the works take on a sudden desperation. The mood fits the sculpture at the gallery’s center. 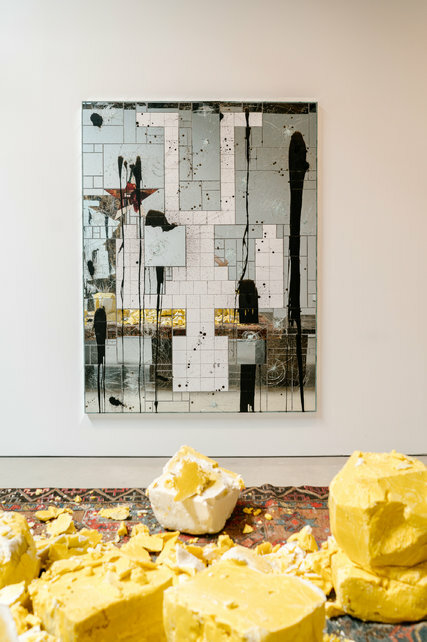 Titled “Untitled (shea butter table),” it consists of a large walnut table burned with brands and lopsidedly draped with a Persian rug (another valued non-Western commodity) on which rest large chunks of the yellow shea butter. One of the world’s first moisturizers and a major ingredient of black soap, this butter is made from the seeds of the African shea tree. Prized by the ancient Egyptians, it is still used by cosmetics manufacturers today. Here it suggests soft gold that has been fought over — many chunks are shattered — or perhaps David Hammons’s disintegrating snowballs. “Fly Away” culminates in a final large gallery with “Antoine’s Organ,” a type of installation Mr. Johnson has developed over the past four years and has not shown in New York before. 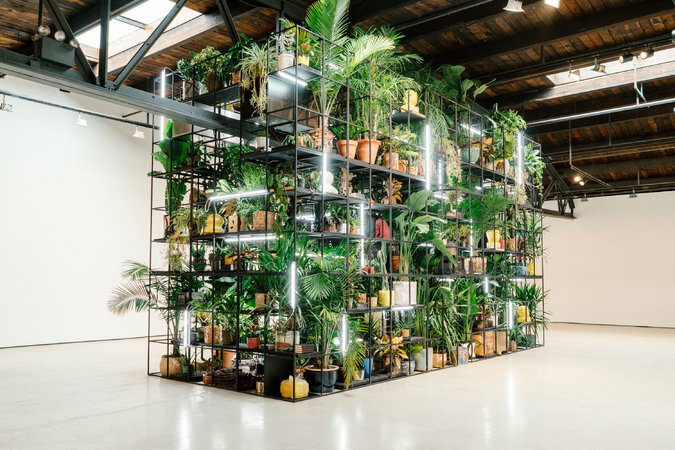 At once exultant and instructive, this large, looming rectangle of black metal shelving is profuse with leafy potted plants and some cacti — a bit of real Eden to pore over, become intimate with. The shelves also hold recurring stacks of books by black authors, from W. E. B. Du Bois’s 1903 “The Souls of Black Folk” to Mr. Coates’s 2015 effort, as well as the Alcoholics Anonymous handbook, whose cover is entirely black. Renée Green’s “Import/Export Funk Office” (1992-93) may come to mind: similar shelving that presented material mapping the flow of hip-hop music among several cities. Mr. Johnson’s work also includes four short videos he made in the early 2000s, sometimes humorously focused on blackness; there’s also more shea butter, sometimes crumbled on Persian rugs, sometimes carved with expressionistic faces. Most planters were hand-built and glazed by Mr. Johnson, and often exceedingly beautiful. This again is a new, promising move. Finally, high inside the shelving is a gleaming upright piano on which the pianist and producer Antoine Baldwin, also known as Audio BLK, plays his own flowing jazz compositions Tuesdays and Wednesdays, from 3 to 5 p.m., and Saturdays from 1 to 4 p.m. They are transporting, but the piece is equally engrossing in silence. “Antoine’s Organ,” which might be called a conservatory in the form of a library, is outstanding. It thoughtfully assembles several of life’s essentials: knowledge, nature and art, along with incessant growth and exchange — a combination that should foster tolerance. “Fly Away” is on view through Oct. 22 at Hauser & Wirth, 511 West 18th Street, Chelsea; 212-790-3900; hauserwirth.com. Antoine Baldwin will perform on Tuesdays and Wednesdays, 3-5 p.m., and Saturdays, 1-4 p.m.
A version of this review appears in print on September 16, 2016, on page C17 of the New York edition with the headline: A Mixed-Media Focus on Race.